Posted by justincc in opensim, opensim-dev, opensim-tech-basics, secondlife. There is a large stock of Second Life scripts already written in LSL. The more accurately our implementation of LSL, the easier it is to reuse that existing code. The syntax and ll functions of LSL effectively constitute a language specification. This allows lots of different open source contributors to work in ‘bazaar‘ fashion. Many different people can contribute patches that implement ll functions piecemeal, with no need to co-ordinate their efforts with other open source contributors. However, LSL is imperfect. Leaving aside any questions about the inconsistency of Linden Lab’s ll function implementations or the deficiencies of the language itself, there is also a lot of missing functionality. For instance, in LSL one cannot teleport an agent (instead various imperfect workarounds have to be used). Neither can one write data to notecards, or find out information about avatar group roles. osTeleportAgent() allows you to teleport an agent to another position and region. osSetDynamicTextureURL() allows you to display an external or dynamically generated image inworld (as used in this inworld webpage display script or my own ‘graffiti board’ script that displays text on a single texture in-world. osParseJSON() allows you to parse JSON within a script. This isn’t such a good example as the HashTable return type probably makes it unusable currently in LSL scripts (the example here is a script in compiled C#). However, I think it could be extended to return a data structure that could be used in LSL. Finally, a method to call the function via this interface must be added to the ScriptBaseClass (which underlies all LSL and OSSL scripts) in the OSSL_Stub.cs file in package OpenSim.Region.ScriptEngine.Shared.Api.Runtime. is set in your OpenSim.ini. If this isn’t set then no os function will run no matter what threat level is set (as discussed below). In the future I hope it will become possible to add new functions via plugins rather than by altering the OSSL_Api.cs file. above. Just as some ll functions are dangerous in a virtual world environment and need to be limited (e.g. llRezObject()), so os functions may also need to be controlled. Therefore, each os function has a ‘threat level’ that is checked before execution. Threat levels range from None (no threat at all), through to Moderate (intentional abuse may cause denial of service) and up to Severe (even casual use may cause region instability and/or data loss). 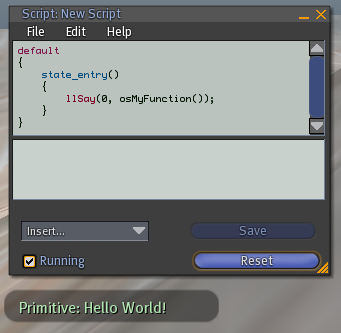 Our example osMyFunction() is rated None because it simply returns “Hello world”. Something like osTeleportAgent() is currently rated High because no security checks are currently carried out before teleport. Region adminstrators can change the level of os functions they prefer to allow by changing the OSFunctionThreatLevel attribute in OpenSim.ini. They can also turn individual os functions on and off. In a public virtual world context you might never want to allow functions with high threat levels. However, in a virtual world where the people allowed in are trusted, or in application virtual environments allowing such functions may make a lot more sense. Great job, but, when you want to draw a text including “;” in it you miss all that come after “;”. Is there any issue to it ? Justin, I cannot see a “OSSL_Api.cs” file in the Opensim bin area.. is it normally empty… with the osFunctions like osSetDynamicTextureURL, osSetDynamicTextureData, etc built in? can we get a l;ist of the built in functions on the OS Wiki? And the threat level for each alongide? Meanwhile, what is the required threat level setting in opensim.ini for the 2 above? Ah, thanks Justin. You blog here also says you can individually enable/dispable osFunctions… is that mutually separate to setting the threat level, and where can you do it – is it in opensim.ini? If I want to say allow 3 specific osFunctions and no others, wehatever their threat level, how is that done? Yes, I see this isn’t documented very well – there isn’t even anything in OpenSim.ini.example for this. There might be something on the wiki but I don’t know where. A link would be appreciated if you can find one. would allow it for everybody no matter what threat level threshold was set (and as long as the general AllowOSFunctions switch is true). would allow only scripts owned by the user denoted by uuid 36bff189-1a29-41dd-aeaa-81139148ec08 to execute osTeleportAgent(). Thanks, I will test with that. Can yo tell if the default for AllowOSFunctions is false as I suspect? If so we should get the opensim.ini.example file amended… it current states the default is true. Can you check and make that change to get everything in sync as a developper Justin? Also, it would be great to get the osSetDynamicTextureData full function set documented on the Wiki, and the 2 examples in the distrtibution lined explicity to the Wiki page so all the xanmplesa are available to a wilki broswer. Though te 3example is a C# one which I am not sure how to compile as I have DotNetEngione enabed. The Opensim Wiki is difficult to fund one way round. I correct the information in OpenSim.ini.example about AllowOSFunctions in r8184. Oops my mistake. The stuff on http://opensimulator.org/wiki/LSL_osFunctions is largely suggestions for functions, not actually implemented ones. I felt compelled to second the notion of Ai @ #8. @Nolo. Oh, I do agree, proper documentation would be very nice. Unfortunately, it seems that my fellow developers don’t always agree with me – hopefully this is an area in which we will improve as OpenSim matures. Actually, I believe that osSetDynamicTextureData is only a thin wrapper around a .NET library function for drawing lines, text, etc. dynamically on a surface. So if one were to hunt that down in the .NET SDK documentation that might provide all the information that you need. thanks for providing this description, but how to implement events in OSSL? Hi Stefanie. Unfortunately, I suspect that there’s no easy way to provide custom events in OSSL at this time without changing a lot of core OpenSim code. Great!!! Worked just fine. Recompiled with VS# 2008 Express, I’m testing my own osFunctions on my Standalone region an all it´s ok! !